Where will “The Great Steverino” be performing at Easter, 2018? Join us for EASTERFEST AT DOWNEY’S FARM IN BRAMPTON!!!! The Great Steverino met the Easter Bunny last Easter and they both would like to see you at Downey’s over the next two weekends. Where can you see Baker Magic Shows this March Break? The Great Steverino is excited to be returning to the Alliston Boston Pizza at 27 Young Street on Monday, February 19th. Where Can You See Baker Magic Shows in October? 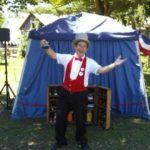 Where is Baker Magic Shows in September? Where can you see Baker Magic Shows this Summer?